Denmark's first ever rooftop farm brings local food production to the city with support from the municipality and the local community. Denmark’s first ever rooftop farm, ØsterGRO, supplies its 40 member families with ultra-local and sustainably produced eggs, honey, and vegetables. By bringing the farm to the city, the project links the farmer directly with the consumer, inspired by the concept Community Supported Agriculture. The organic urban farm is run by the three employees, its members and volunteers. 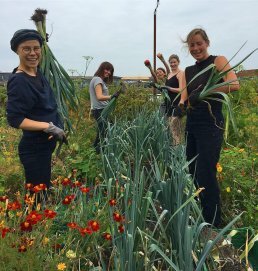 The rooftop farm has been established with support from the Copenhagen Municipality, but today the project is self-sustainable and financed through revenue educational activities and membership fees from the families involved amongst other revenue streams. The plants and soil retain rainfall, but the farm also has a water reservoir running beneath the beds with a capacity of 7 m3. Also situated on the roof is the restaurant Gro Spiseri. As part of the experience, guests receive a tour of the farm. This is just one of the many ways in which the green urban space educates its 13,000 annual visitors about food waste and sustainable food production. At the same time, the farm contributes to climate proofing the municipality. Below the raised flower and vegetable beds, there is a 350 m2 water reservoir where rainfall is collected for the irrigation of plants during the growing season. At ØsterGRO all raw materials are used and recycled. This helps to educate visitors about sustainability, the climate and resource challenges, as well as the need to reduce food waste. Seeing, working with and tasting unprocessed products directly from the ground can inspire citizens to switch to a healthier and more plant-based diet, as well as promoting local farming. ØsterGRO has created a community where citizens of all ages can meet and experience urban farming. The farm is also used as a restaurant and provides space for other activities such as yoga. Copenhagen Municipality is Denmark's largest municipality and home to the capital of Denmark.